This item is a special order item. Delivery may take up to 3 weeks from the time you place your order. If you have also ordered items in stock with special order items, the items in stock will be shipped separately with normal time frame. Loreal Serie Expert Absolut Repair Masque is an ultra-rich deep penetrating reconstructive conditioner that repairs extremely dry and damaged hair. 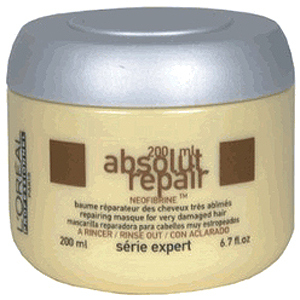 Restore your hairs softness, sheen and strength with the ultra hydrating power of Serie Expert Absolut Repair Masque. Infused with Loreal's unique Neofibrine technology, Absolute Repair Masque will leave your hair feeling smooth and incredibly manageable.